MOBILE, AL – Locally-owned Aaron Oil Company, Inc. celebrated its 35th Anniversary on Friday, August 5, 2016 at the GulfQuest Maritime Museum in Mobile, Alabama. RSA and GulfQuest helped Aaron Oil commemorate this special occasion by lighting their buildings in downtown Mobile, in red on Friday, August 5th. 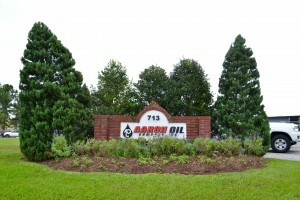 About Aaron Oil Company, Inc.
Aaron Oil Company, Inc. was incorporated on August 6, 1981. The Company’s corporate office is located in the RSA Tower in Mobile, Alabama and its operational facilities are located in Saraland, Alabama and Berwick, Louisiana. The Company specializes in helping its clients manage their obligations to properly recycle, treat and dispose of petroleum-related non-hazardous wastes. Aaron Oil holds important federal and state permits that allow the Company to manage, reclaim, recycle and dispose of various waste products as well as non-waste products and materials that contain recoverable products. In particular, the Company serves customers with wastes associated with used oil and petroleum reclamation, antifreeze, coolants, oil filters, oily water, petroleum-contaminated water, dirt or solids, and other petroleum waste water. Also, the Company collects and processes absorbents that are used to clean up spills from sources that generate these materials. Additionally, the Company processes the used oil it collects to an on-specification industrial fuel or blend stock fuel that it sells to its end markets as a fuel for industrial use or for blending to make high quality fuel oil. The Company’s wholly-owned subsidiary, International Hydrocarbon Services, LLC sells diesel fuel through its land-based fueling operations. The Company is committed to the development of cleaner, safer technologies for a healthier environment. In 2009, Aaron Oil became the country’s first petroleum reclamation company to be certified under OHSAS 18001, an international standard for occupational health and safety management systems. In addition, the Company is the only petroleum reclamation company to hold both the ISO 14001 and OHSAS 18001 certifications. It has been recognized for excellence by CHWMEG, a non-profit trade association that conducts comprehensive audits of waste and recycling vendors.